Born Louis-Marie Grignion on January 31, 1673 in Montfort, France, this saint was the oldest surviving child of a large family. Even as a young child, Louis exhibited a remarkable spiritual maturity. At the age of twelve, he was sent to the Jesuit College of St. Thomas Becket in Rennes where he developed a strong devotion to the Blessed Virgin Mary. Awareness of the needs of the poor and the sick also developed during his years at St. Thomas. Together with some of his classmates, Louis spent some holidays tending to the needs of the poor and nursing the sick in hospitals. At some point during his college days at St. Thomas, Louis became conscious of a calling to the priesthood. Upon completing his studies, a benefactor provided an opportunity for him to study at the Seminary of Saint-Sulpice in Paris. In 1693, at the age of twenty, Louis set out on foot for Paris. Along the way, he gave away all of his money to the poor that he met and even traded his finer clothing for the rags and tatters that they were wearing. This was to become his life-style for the remainder of his life. Upon arrival in Paris, Louis learned that the money provided by his benefactor was not sufficient to pay his tuition, room, and board at the seminary. The alternative was to live in a succession of boarding houses run by Sulpician priests while studying theology at the Sorbonne University. The rigors of his life-style and the poor nutrition and sparseness in his lodgings took their toll on Louis’ health. After about two years in these conditions, he became very ill and required hospitalization. Restored to improved health, Louis found that a place had been added for him in the seminary, which he entered in July, 1695. 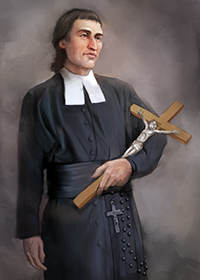 Ordained to the priesthood in 1700, Louis spent a few years as a chaplain in a hospital, however, in 1705, he recognized that his true calling was as a preacher. During the remainder of his life, Louis preached in many towns and villages. Fr. Louis had a strong positive influence on the people to whom he preached, but, as might be expected, this made him many enemies, among them the Jansenists. The schismatic teachings of Jansen had quite an extensive following around this time in history. Jansenists believed that man was inherently evil and predestined for hell without the strong intervention of God. Minor acts, such as fleeting thoughts, were sinful. Only by frequent confession, at least daily, if possible, and always confessing immediately before receiving Eucharist, could salvation be accomplished. As an example of the power of the Jansenists, Louis, with the enthusiastic help of hundreds of peasants who worked with pay for over a year, constructed a Calvary monument on a hill near Fr. Louis’ church. Under the influence of Jansenists, the King of France ordered that it be taken down and the hill restored. Under the watchful eye of a company of soldiers, 500 peasants spent several months dismantling the monument. Despite his conflicts with the Jansenists, Louis de Montfort was also an inspired writer. He wrote several books encouraging devotion to Mary. Several of these are available today and one, The Secret of the Rosary, is still the most influential work on the rosary. Fr. Louis de Montfort died on April 28, 1716, at Saint-Laurent-sur-Sèvre in the Vendee department of France. A measure of his lasting influence was the strong resistance of the people of this region to the anti-clerical revolution, which took place three quarters of a century after his death. St. Louis de Montfort is the patron saint of preachers. An optional memorial on April 28 honors him. Louis de Montfort's message today: All of us meet obstacles in life’s journey. St. Louis overcame those that he encountered by frequent prayer and devotion to Mary. What is your reaction to the difficulties that occur in your life? Try asking Mary and the saints for their intercession.